Last fall, I planted 250 anemones in the middle of the cold frame to see if they would overwinter and possibly bloom sooner then anemones we sprout indoors. I have been troubleshooting a fungus issue with my De Canes varieties no matter where I start them. I have lost most of the corms–they’ve rotted and turned to mush. But all of our Jerusalem Mix corms have survived, and that’s what we’ll conduct Spring experiments with. Being that it has been a very cold winter I was not expecting success. To attempt to protect the corms from the extreme weather, they are planted 6″ deep, covered with bark mulch; then with hoops and 3 layers of row cover. I have also been running a space heater under the row cover once per week to keep the ground from freezing too hard. They were shooting up! “IT WORKED! !” I shouted. So we will see what yields during the next few months. But this potentially could save me: time, money, space & hours of worry. Hooray!! Another possible panacea from my anemone blues. The pre-sprouted anemones that were started in the house were planted last week in the cold frame alongside the overwintered ones. There are 250 plants total, from the 500 corms we stared with. A better yield so far than last year. 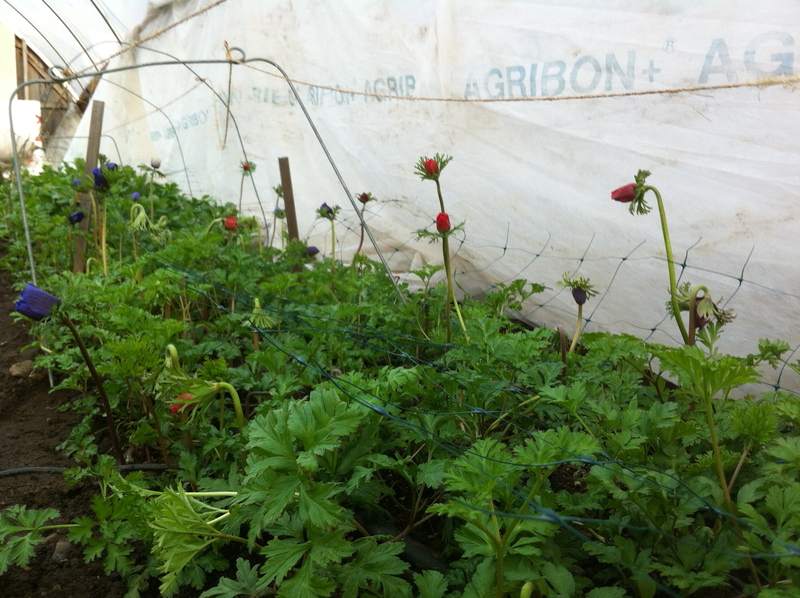 2013 anemone crop…this year’s have a way to go before they bloom. Stay tuned…hoping for blooms mid to late April. Thanks for sharing. I am watching to see how it all turns out.